A couple of weeks ago I mentioned that I was planning on attending the Alliance annual Awareness Day for Individuals with Developmental Disabilities at the State Capitol. Well, I did attend, and the event was fantastic. The two individuals with developmental disabilities who led the Pledge of Allegiance in House and Senate Chambers at the Capitol were incredibly inspiring. The luncheon was packed, and more State legislators attended the luncheon than ever. This was especially important, because not only did they get to see a nice presentation about the history of services (and successes) for individuals with developmental disabilities in Colorado, they were also on hand for the presentation of the Alliance Direct Support Professional (DSP) of the Year Award. Alliance member organizations nominated their direct service professionals for this award to recognize the unsung heroes who have dedicated themselves to helping individuals with developmental disabilities to reach their full potential. The quality of the entrants was overwhelming and inspirational. The nominees shared several things in common – a willingness to go above and beyond what is required of them, an ability to see solutions where others see only barriers, and most importantly, a deep and unyielding commitment to the individuals they serve. Two Imagine! employees were among the finalists for this prestigious honor. While neither of them ended up being selected as the Alliance DSP of the Year, I am honored to work along side of them and humbled by their support of some of our community’s most vulnerable citizens. One of the Imagine! nominees, Brian Shaw, was highlighted in a recent blog post of mine about Imagine!’s 2009 Employees of Distinction. You can read about him here. Not only is Pramila the most diligent and hard-working staff I have ever encountered, she is without question one of the most dependable and reliable; add to that a steady kindness and compassion that knows no bounds. Because of the dedication she has to her position, in the course of any week, she has already gone above and beyond the expectations of her job. Any time an extra activity is suggested on top of her 40 hours already worked, she is the first to say, “I can do that”. Pramila is special, she does a lot. She likes to go out for walks with me; we go to the park. She makes me laugh, like if we are just hanging out having a cup of coffee, she cracks me up. She likes to listen to country music with me. She helps me on the computer; we check my email and go on to Facebook, we do Farmville together. I like hanging out with her. Pramila has been the most outstanding staff. She is patient, and caring, and treats my daughter like her own child. She doesn’t just do her job, she goes so far beyond that that it is hard to describe. Pramila has a calm quiet manner, but her attention to the dignity and respect of the consumers is unmatchable. She advocates for my daughter, she dresses her in a fashionable way, applies makeup, adds jewelry, takes her to do the things she likes to do. Pramila is a quiet rock that grounds the house in honesty and integrity. I wish we could clone her. I can honestly say that Imagine! enjoys a reputation as a leader in the community of organizations that serve individuals with developmental disabilities. That reputation is a direct result of the amazing people we have working for us, and Brian and Pramila are two of the best! My hat is off to both of them. Lately I feel as if I have been channeling Jim Mora. I feel bad for Coach Mora that he is remembered mainly for this rant, because he was a decent coach, and because despite the apparent meltdown in the clip above, the underlying message of what he was saying was correct. A team can’t start talking about playoffs and championships until they make sure they have their fundamentals set, and know what they are supposed to be doing, and are prepared to execute the game plans. Now, before you scream “heretic” and start throwing rotten vegetables at me, hear me out. I find it abhorrent to know that there are individuals in our great State that desperately need services and don’t have the funding to receive those services, and I am dedicated to finding solutions to ensure that everybody who needs services can access them. But the current focus in our State on the waitlist is problematic for two reasons: the waitlist data is extremely flawed, and the flawed data is increasing our collective escape avoidance behavior; you remember the old operant response that gets you away from an ongoing punishing stimulus. Let’s look at the first issue: right now, there is no set, agreed upon number of individuals waiting for services in Colorado. According to Medicaid, an individual can’t be officially on the adult waitlist until he or she is 18 years old. But the State Division for Developmental Disabilities says the waitlist starts at 14 years old. Beyond those contradictory definitions, there is also a question of what exactly it means to be on a waitlist. If an individual is currently receiving Supported Living Services, but is on a waitlist for Comprehensive Services, is it really accurate to say that the individual is waiting for services? Even with these confusing factors, the numbers that seem to be consistently bandied about when discussing the waitlist are usually between 10,000 to 12,000 people waiting for services. That number leads to the second problem – the (apparently) huge numbers of people who need services (punishing stimulus) scare people off from suggesting any viable solutions. Think about it – on average, the annual cost of a Comprehensive slot in our area is around $80,000. Let’s say that half the people on the waitlist are waiting for Comprehensive slots (hey, in the absence of any real data I figure I can just throw numbers out there as good as anyone). If we use 4,000 as the number of individuals waiting for adult services as a basis, that would mean 2,000 folks are waiting for Comprehensive Services. $80,000 X 2,000 = an annual cost of $160,000,000 just to serve those individuals. Considering the current state budget crisis, no elected official is going to propose that the State should fund those services. And the emphatic defeat of Amendment 51 during the last election made it clear that Colorado voters have no desire to raise taxes to fund services. So we find ourselves in a stalemate which won’t go away until we step back and stop using inaccurate waitlist data as our starting point. What we do know is the number of adults receiving a service, and their relative level of need. For all kinds of practical purposes, wouldn’t it be great to know how many eligible adults are not receiving a service and their relative level of need? This would describe the total demand on the system. Then, just for fun, throw out the impractical waiver descriptions, and place this known demand on a continuum based on the relative level of need. Describe the services as an increasing continuum of care and attach a true cost of service. We have learned from previous experience that knowing a service is available when needed is often enough, and that true expenditures will stay below the budget allowance. This demand management principle allows us to shift to new service strategies. Until then, it is premature to talk about ending the waitlist. We need to step back first and discover what the real need is, and then ask the important questions that will provide answers that are relevant to meeting that need. The most effective medicines treat the underlying cause of a disease, not just the symptoms we see on the outside. We need to apply the same principles in our quest to serve our communities better and more efficiently. Sometimes the easiest thing to do for my Good News Friday posts is to let someone else do the talking. Take a look at the note below. It is part of an email that was sent to Leona Stoecker, the current president of the Imagine! Foundation Board of Directors. The author of the email has a daughter who receives services from Imagine!, and was planning a tour of the Bob and Judy Charles SmartHome. Good stuff that makes me proud to be part of Imagine!. The Longmont SmartHome is just down the street from us and I enjoy watching the progress in construction. Our daughter lives very nearby in a condo. She lives independently, without a roommate. Imagine! supported living staff members check in on her and assist her with grocery shopping, household chores, and community outings. She constantly amazes me with how well she does in her life! She started receiving services through Imagine! when she was 18 months old through the Infant Stimulation program that began that year (1973). So I know about their great services and I am really glad to be back in Boulder County so that she is back under Imagine!’s services again. I have written several times (like here) in this blog about the need for all of the stakeholders in the DD world to work together in order to find some solutions to the many problems facing our system right now. I am convinced that we do not know the extent of our problem because our system of design is so fractured. We do not know of better, more economical service designs, or what would it would cost to address the needs of those with intellectual disabilities. A lack of coordination between stakeholders has led, in my opinion, to small solutions – solutions that are focused too narrowly to bring about much needed systemic reform. But I need to add a caveat to that statement, one that may not be popular but that I think needs to be stated anyway: I’m not sure that DD system stakeholders are in the best position to design new solutions. Why do I say this? Well, sometimes stakeholders are a little too close to their own personal situation to be able to step back and see the bigger picture. Digital time keeping wasn’t a product of Swiss watchmakers. Stakeholders draw attention to the need and communicate personal knowledge and experience. Stakeholders will move society to answer the question, “Are we going to support the needs of citizens with disabilities?” Someone else, who has the curiosity, but not a direct interest, will answer the question, “How are we going to support the citizens?” Just as the US Olympic Bobsled Team’s hope for gold medals is supported by NASCAR. A close examination of the history of services for individuals with developmental disabilities in our nation supports this opinion. It seems as if the real changes have generally come not through the efforts of stakeholders, but rather because of outside influences, such as the academic world or journalistic exposés. By 1965, with over 6,000 residents in an institution planned for just 4,000, Senator Robert Kennedy was calling Willowbrook a “snake pit.” In November 1971, a local newspaper, The Staten Island Advance, published a series of articles detailing the horrible conditions at the school. Following these articles, in 1972, WABC-TV in New York sent rookie reporter Geraldo Rivera to Staten Island to infiltrate the Willowbrook State School. Rivera gained entry using a stolen key and documented the brutal and horrific living conditions of its residents, which included both children and adults. The resulting documentary, "Willowbrook: The Last Great Disgrace" won a 1972 Peabody Award and prompted an immediate government inquiry. The public revelations of the institution’s squalid conditions gained national notoriety and opened the door to legal action, resulting in the signing of a consent judgment in federal court in 1975. Clearly we have made giant steps of improvement. Yet citizens and families still lack the wraparound support suggested in the clip above, even though it dates back to the early 1970s. Change is still demanded. Or how about the research of Frank Rusch at the University of Illinois? According to Wikipedia, his work . . .
included testing a model of supported employment that became the preferred approach for individuals with disabilities in the United States. Widely recognized as responsible for the birth of supported employment as an alternative to sheltered employment, Rusch and his students influenced the way special education and rehabilitation funded training, evaluation and long-term employment in this country. Over a five-year period, Rusch and his students helped start over 125 supported employment programs in the states of Illinois and Kansas. These demonstrations led to over 100 publications by his students between the period beginning 1987 and ending in 1994. And there are countless other historical examples. Even today, outsiders are being shown to be extremely beneficial in giving a fresh perspective on issues that those of us on the inside are struggling with. Recently, the Colorado Division of Developmental Services asked the University of Maine to assist in defining appropriate safeguards and protections related to potential conflicts of interests arising from the multiple roles of Colorado’s community centered boards. While I would argue that the university was given the wrong set of questions to study (that’s a topic for a later post), I don’t argue that the report the institution produced was thorough and thoughtful response to the questions they were asked to examine. So it makes sense for all of us inside the support system for intellectual disabilities to consider looking outside the system for help in solving some of our biggest issues. Would we fear some of the solutions we might be presented with if we do so? Possibly, probably even. Should we fear solutions we might be presented with if we do so? No. Not if we really want to discover legitimate, long term solutions for system reform in our field. I would like to offer my sincere thanks to everyone involved in last Friday’s Imagine! Foundation Celebration Dinner and Auction. Once again, generous members of our community came out in droves to support Imagine! and our mission of providing individuals with cognitive, physical, and developmental disabilities opportunities to live fulfilling lives in their homes and communities. 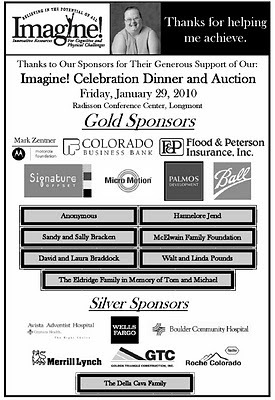 More than 360 people packed the Radisson Conference Center in Longmont and bid early (and often) during both a silent auction and a live auction. When we combined the totals of the auction with what we earned from our sponsorship, table, and ticket sales, it turns out we brought in more than $212,000 to support some of our most vulnerable citizens! Amazing! You can read more about the celebration in this article from the Longmont Times Call. I also encourage you to take a quick look at a list of our many generous sponsors below. If you weren’t able to attend, I’d like to share with you two videos that were debuted during the evening that exemplify how Imagine! meets its mission, something we are able to do because of the incredible support we enjoy from our friends and neighbors. First, check out this video of Doug Coker, the 2009 Imagine! Consumer of the Year. Then, take a look at this video about our SmartHome project – it provides a look into the why and how of this ambitious project, and shares some early success stories. When I see the kind of turnout we had this past Friday, I’m confident there will be many more of these stories to come. I’ve been thinking about goal setting a great deal lately. Much of it has to do with the fact that the Winter Olympics - which features some of my all time favorite sporting events - are fast approaching. And when I see and hear about the individuals who are about to perform on this grand stage of the sporting world, it never ceases to amaze me when I think about the planning, training, sacrifice, and goal setting it took them to get to the elite level of Olympic athlete. I have also been thinking about goal setting in terms of organizations that provide services for individuals with cognitive and developmental disabilities. I get the sense that sometimes we (and I use the collective term “we” because I want to make sure my organization, and me, are included in this gentle critique) are often frightened away from setting goals, because we think we will be seen as failures if we don’t meet set goals. Instead, we often wait for events to dictate how we act, and react, to situations around us. I know that has been the case here at Imagine!, and I’d even go so far to say we have been pretty successful taking this approach. Times are different now, however, and I don’t think we can afford to wait and see what happens before we act anymore. If we do that, we may soon find there is nothing left to act upon. Instead, I think it is time we all became a little more comfortable with the idea of setting goals. Become more comfortable with forecasting what might happen and take appropriate steps beforehand to improve the likelihood of positive outcomes and mitigate the possibility of negative outcomes. At Imagine!, we have been increasing our efforts to plan, forecast, and set goals. We have a Strategic Planning Team that meets quarterly, and one of the most recent efforts of the team, involving all team members, has been to create departmental purpose statements to help guide our decision making process moving forward. The philosophy behind these purpose statements is fairly simple. Each person at Imagine! is hired to perform a task. We want to connect our staff members with one another, to our consumers, families and stakeholders on an emotional level. Each staff member can be held accountable for ensuring delivery on the “purpose” every day. All tasks are secondary to the purpose. Process, policy and procedure must support the delivery of the purpose as well as task competency. Tasks are what we are paid to do – purpose is why we are here – and why we do it as Imagine!. Bringing this back to my original point, the purpose statements help bring clarity in goal setting. Furthermore, it lessens the concern about failing to meet a goal. We want to hold our employees accountable to our purpose, and if a goal is set that meets our purpose but doesn’t pan out in the end, well, then, we learn our lessons and move on. Our hope is that this will encourage more creative thinking when setting goals, and that will result in a workforce who will be unafraid to take a position on who we want to be as an organization in the future and take the appropriate steps to get there. We’re not there yet, but I feel good about the direction we’re heading.